Iñigo won’t be returning to the US anytime soon as he is to start filming his second movie. 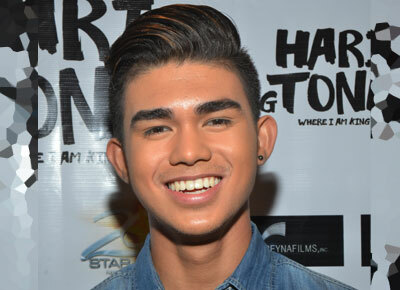 It seems that Iñigo Pascual is having some incredible luck in the country as the budding star and the only son of Ultimate Heartthrob Piolo Pascual has been tapped to make his second film in showbiz. This time though he’s set to star with other love teams composed of James Reid, Nadine Lustre, Shy Carlos, AJ Muhlach. Onscreen, he will be paired with Julia Barretto for the big screen adaptation of Marcelo Santos’ best-selling book Para Sa Hopeless Romantic which will start shooting soon. “Ako I’m excited kasi as she said pina-pag pair up kami matagal na rin po and this is my second film. Tapos excited na rin po ako kasi na-read ko ang story and it’s a nice story so I’m very excited to do the film,” said Iñigo in an interview during the recently-concluded story conference of the upcoming film. Having met each other for the first time some months back, Iñigo confessed that he was initially intimidated by Julia. “Actually at first I was intimidated, I didn’t know how to talk to her. Pero once you talk to her super simple, very light and fun and chill to talk to,” he recalled. Meanwhile, confirming his father’s earlier revelation about his withdrawal from being part of US boy band, Iñigo remains happy since he is getting lots of offers in the country. “That’s one of the decisions that I’m actually thinking about right now because there are some offers here naman po that are great as well so it’s hard kasi hindi ko pa po alam kung ano ang gusto kong gawin,” Iñigo said. As previous reports have noted, the Relaks It’s Just Pag-ibig actor is only supposed to finish his movie’s promotions before heading back to the US to finish his studies. But according to Iñigo there has been some change in plans. “Originally dapat two months pero I’m actually considering staying for some time,” he said. “I’m not yet done with high school so I just have to prove that I can juggle both education and career at the same time,” he adds hinting at his keen interest to join showbiz despite his father’s visible reluctance. But how about his career in the US? “I don’t really know how to answer that right now because we’re still negotiating with the contract and all that so mahirap mag-decided kasi maganda rin ang mga offer dito,” he confessed.